38 / the tasting panel / april 2016 A LONE STAR LIFE L egend has it that in the late 1970s an Austin bartender was drinking somewhere South of the Border and was served a Margarita in a Martini glass. She thought it was a neat idea, so when she returned to work at the Cedar Door she convinced the owner to do the same. Let's recap: A Margarita served in a Martini glass. "Yes. She was served a Margarita in a Martini glass," confirms Ash Blaize, General Manager of the Cedar Door. So, big deal, right? 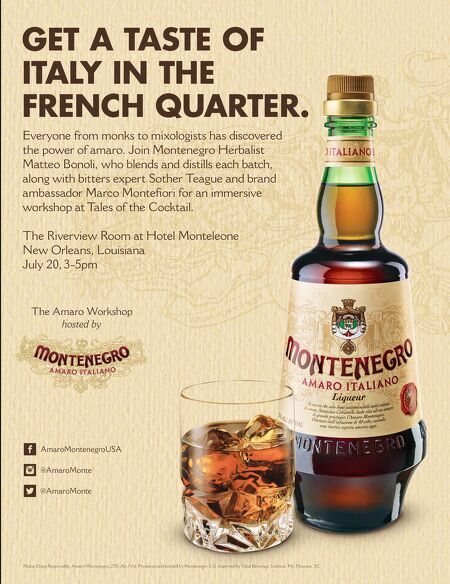 Right, except, it really did become a big deal after they dropped in an olive and called it a "Mexican Martini." More than three decades later Cedar Door can move 1,000 Mexican Martinis a week, and that's not the end of the story. "It's really an Austin institution," Blaize says. "More bars and restaurants than not serve some form of a Mexican Martini." To be clear, that means that Austin bars and restaurants serve Margaritas in Margarita glasses and Margaritas in Martini glasses under a different name and everyone is totally okay with it. Of course, the Mexican Martini's appeal is probably also linked to its amped-up alcohol, not to mention the traditional shaker on the side as part of the presentation. Plus, there's that strict "limit of two" per customer, so, it checks all the right boxes: exotic, quirky, slightly dangerous. The Cedar Door, which also sells its own proprietary Mexican Martini & Margarita Mix, features the original cocktail (see recipe), as well as the "Austin Ultimate," made with Z Blanco Tequila and Paula's Texas Orange, and a spicy version with Tanteo Jalapeño Tequila—a lineup that Blaize says is enough to regularly exhaust his supply of individual shakers. And that's the story of the Mexican Martini, which Blaize tells a lot, even though there are plenty of cocktail choices, like his homage to his grandfather and the Gin and Tonic served in a wine glass. "It's called the 'White Hawk,'" he says. "My grandfather's CB handle was 'White Hawk,' my grandmother's was 'Lady Hawk.' When he was on his way home, I remember his voice coming over the CB, 'White Hawk returning to the nest.' He was a gin man." It's a good story, too. The Mexican Martini The house specialty at Austin's Cedar Door ◗ 2–2½ oz. Cedar Door Original Mexican Martini Mix ◗ 2 oz. tequila ◗ 2 oz. triple sec ◗ 1–2 oz. lime juice Adjust the lime juice and Mexican Martini Mix to taste. Shake over ice and strain into a Martini glass. Garnish with olives. The White Hawk ◗ 1½ oz. Bombay Sapphire Gin ◗ ¾ oz. St-Germain ◗ 2 good splashes of tonic ◗ Orange slice Build drink in shaker tin. Squeeze orange into tin, including pulp. Put peel in wine glass half filled with ice. Shake tin vigorously and strain into glass. 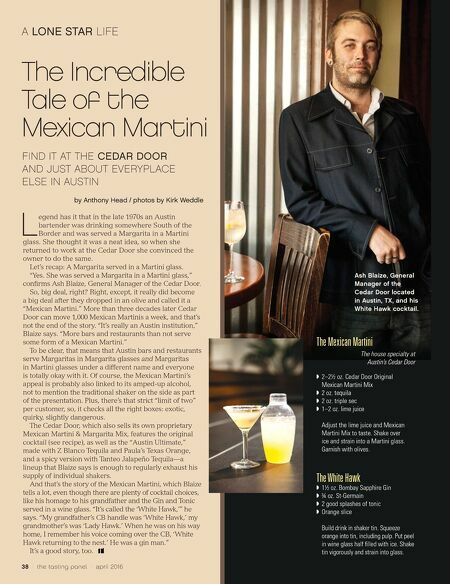 FIND IT AT THE CEDAR DOOR AND JUST ABOUT EVERYPLACE ELSE IN AUSTIN by Anthony Head / photos by Kirk Weddle The Incredible Tale of the Mexican Martini Ash Blaize, General Manager of the Cedar Door located in Austin, TX, and his White Hawk cocktail.